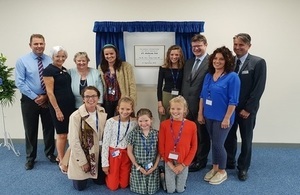 Business Secretary Greg Clark celebrated generations of entrepreneurial spirit as he opened a new state-of-the-art distribution centre and office in the Midlands today (Thursday 6 September). Derbyshire-based logistics business ATL is a firm that has seized on the growing popularity of online shopping that has seen demand for warehouse space surging over the past decade. ATL has supported jobs in the area for 60 years since its formation in 1959 and today has a workforce of around 220 people. In the past 5 years alone, the company doubled in size and its new 190,000 square foot centre will double the businesses capacity to 32,000 pallets and support 50 further jobs – another showcase for the economic success of the Midlands Engine. The Midlands is vital to the UK economy and home to some of our most iconic and productive businesses. It is a place with unique strengths and this government is committed through our modern Industrial Strategy to making it an even better place to live, work, study and do business, improving opportunities and quality of life for the people of the region. ATL is a brilliant example of the entrepreneurial spirit that exists in the region and has a proud history as a business run by the same family for 60 years, consistently delivering good jobs in the area while evolving and adapting over decades to ensure it continues to thrive. It’s fantastic to be able to showcase ‘ATL Midlands Hub’ along with those people who helped to make this happen and we’ve worked with on this journey. The Ascott family have done a brilliant job in developing ATL from a local haulier into the thriving business it is today and they should be very proud of what they’ve achieved. Property research firm CBRE estimates the growing popularity of online shopping has contributed to a near doubling in demand for warehouse space over the past 10 years. Approximately 235 million square feet of warehouse space was leased or purchased between 2007 and March 2018 - equivalent to more than 3,000 Wembley Stadiums. ATL, which has a fleet of 90 vehicles and 150 trailers, has been based at Foston since 2002, after moving from Burton. At the time of the move, the company, run by joint managing directors brothers Pete and Joey Ascott, employed 15 people. The Strategy also confirmed the funding awarded to specific projects from £392 million allocated to the Midlands from the Local Growth Fund.
. Family firm grasps online shopping boom to boost jobs. 2018-09-06.